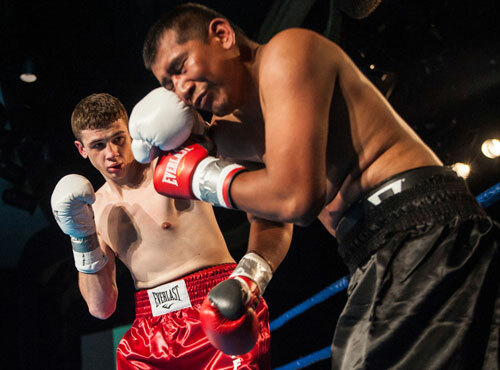 Thomas "Cornflake" LaManna, 21-1, 9 KOs, made short work of Mexican Engelberto Valenzuela, 10-8, 3 KOs, in a scheduled 6-round junior middleweight bout at the Claridge Hotel in Atlantic City Friday night. At the opening bell, LaManna jumped right on his opponent, clearly looking to end matters as quickly as possible. 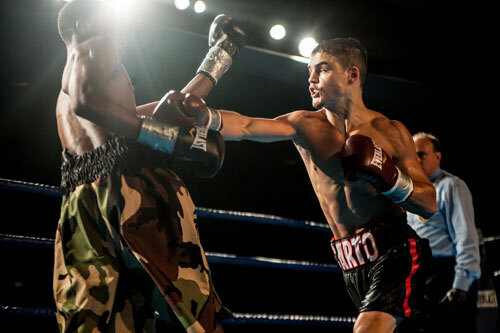 With a proposed September bout against Dusty Hernandez Harrison dependent upon a victory on this night, LaManna left nothing to chance against Valenzuela. LaManna began by jabbing but before long, started to toss optimistic power shots at his opponent. Ninety seconds into the bout, LaManna scored a volley that sent Valenzuela into his own corner. The Mexican covered up, but LaManna peppered him with his entire arsenal. LaManna relentlessly fired to the head, scoring several hard blows. However it was when Cornflake landed a single shot to Engelberto's body that the Mexican suddenly folded in the middle and sunk to the canvas, his back resting heavily against the blue corner pad. Referee Harvey Dock swooped right in and halted the fight after just 2:17. The victory kept LaManna busy and set up the interesting date with the unbeaten Harrison (29-0-1, 16 KOs) of Washington, DC. Their planned welterweight meeting appears scheduled for September 16th at the Taj Mahal in Atlantic City. 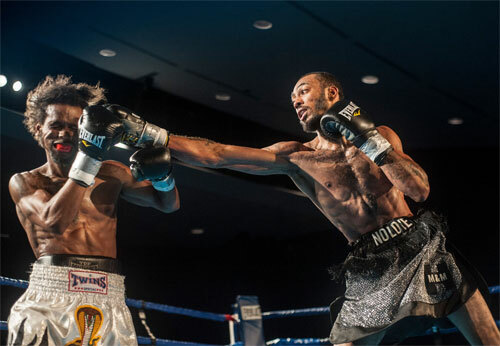 In the 6-round main event, Atlantic City local Anthony “Juice” Young, 13-2, 5 KOs, won a workmanlike unanimous decision over Eduardo Flores, of Ecuador, 23-22-3, 15 KOs. Young pretty much ran the table over the course of the fight, winning five of the six rounds on my scorecard. Flores had his best round in the fourth when he picked up his output pace and have the better of several exchanges. However, the rest of the night belonged to Juice. It was Young’s first headlining gig, and his Atlantic City fan base noisily cheered him on. Young clearly mastered Flores, but looked hesitant to press the action and go for the kill. This resulted in a full-limit bout won comfortably on all three judges’ scorecards. Mark Constantino had it a 60-54 shutout, while John Stewart and Pierre Benoist saw it a round closer, 59-55. 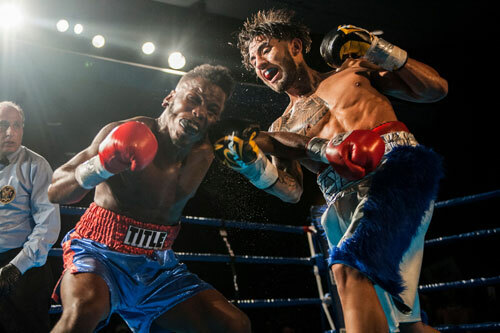 Light heavyweight Fanlong Meng, 8-0, 6 KOs, remained undefeated with an impressive beat down of veteran Daniel Judah, 24-11-3, 11 KOs, in their scheduled 8-rounder. Meng, a 2012 Olympian for China, won the first four rounds against Judah, who offered little in return. In round five, Meng backed Judah to the ropes and uncorked a hard left that sent the New Yorker and fellow southpaw reeling. The ropes clearly kept Judah from hitting the canvas. So referee Rickey Gonzalez called it a knockdown. Gonzalez looked at Judah and began to count, but then called a sudden stop to the fight. The time was 2:08 of the fifth. Gonzalez called the result a KO (and not a TKO). 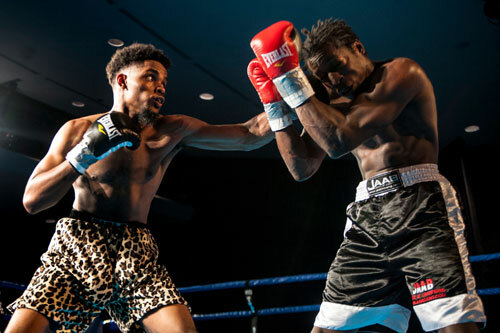 Philly junior lightweight Donald Smith, 1-0, made a successful pro debut with a 4-round unanimous decision over awkward Indiana southpaw Cameron Cain, who also made his debut. Smith was more accurate, busier and landed the harder punches. After four full rounds Smith easily won the decision by scores of 40-35 and 40-36 twice. 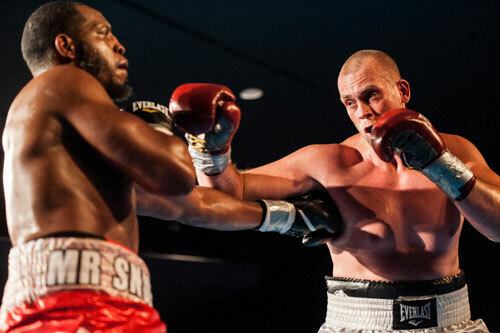 In a heavyweight rematch, Dan Pasciolla, Brick, NJ, 8-1-1, avenged his previous points loss to Philadelphia's Dante Selby, 2-2-1, by winning a 6- round unanimous decision. Last time, in Pasciolla's 2013 debut, Selby had the advantage, a few steps down the Atlantic City boardwalk at Bally's Casino. However this time, Selby looked rusty and off balance most of the way, while Pasciolla kept throwing punches and maintained the lead. In round two, Pasciolla blasted Selby with a series of punches that propelled him hard into a neutral corner. He did not go down, but the corner pad kept him up, and referee Rickey Gonzalez correctly called it a knockdown. 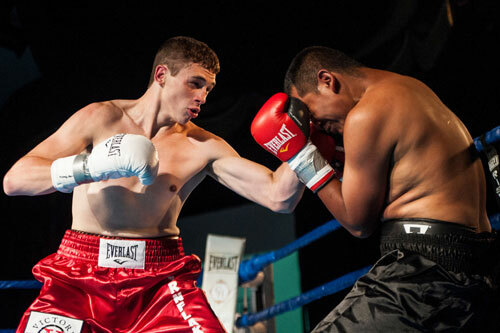 After six rounds, Pasciolla claimed the decision by scores of 59-54 and 60-53 twice. Bantamweight Christian Carto, Deptford, NJ, overpowered debuting Christopher Nelson of Indiana, to capture his second professional win, 2-0, 2 KOs. 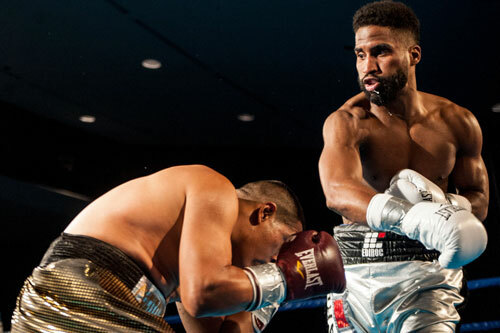 Carto floored his overmatched opponent three times, once in the first, once in the second, and once in the third, before referee David Franciosi halted the bout at 51 seconds of round three. For Carto it was the type of impressive and powerful performance that makes fans hungry to see him again. Even in the amateurs, Carto had an exciting professional style and local fight fans should be in for a treat watching him make his way in the pros. In a battle of debuting New Jersey bantamweights, Atlantic City's Dallas Holden, 1-0, (above left) scored a surprising unanimous decision over North Bergen's Kevin Asmat, 0-1. I scored the bout a shutout for Asmat, but all three official judges had the fight 39-37 for Holden. Perhaps the judges were confused about which fighter was which? There really could be no other explanation for the controversial result. 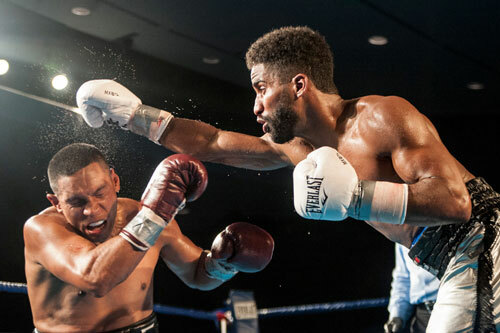 Millville, NJ lightweight Marvin Johnson, 1-0-1, dropped DC southpaw Lamont White in round three and went on to take the unanimous 4-round decision by dominant scores of 40-35, 40-36 and 39-36. 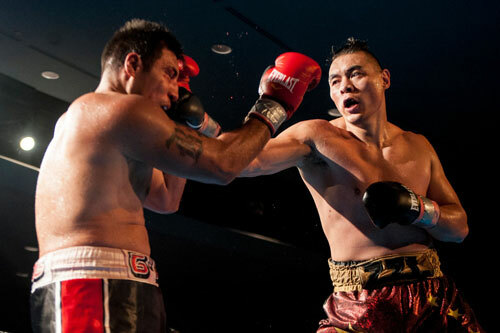 In the opening bout, 2008 Olympic Silver Medalist for China, Zhang Zhilei, 11-0, 7 KOs, won a 6-round unanimous decision over Californian Rodney Hernandez, 10-5-1, 2 KOs, in a heavyweight bout. 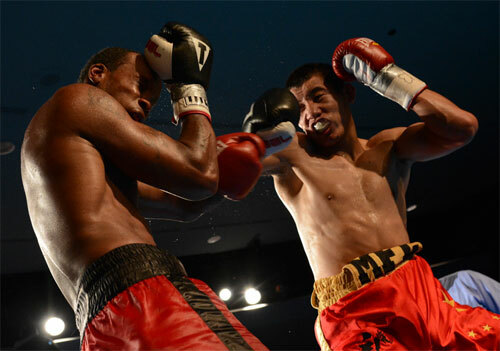 Southpaw Zhilei drilled his opponent with power lefts all night and opened a nasty cut over Hernandez's right eye. The wound, as well as Rodney's nose, bled throughout the fight. Hernandez hung in and took a few mighty swings of his own, but he could not turn the fight around. 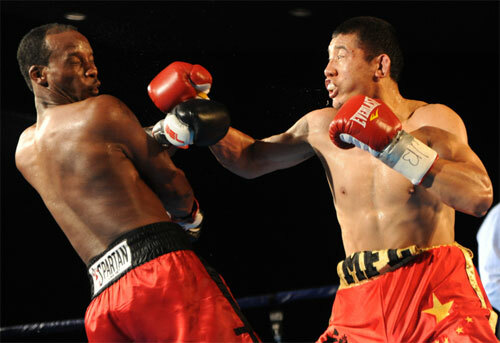 The consistent battering by Zhilei took the starch out of Hernandez and earned Zhilei a one-sided victory. The three judges scored the fight for Zhilei, 59-55 and 60-53 twice. The nine bout card was promoted by Rising Promotions, their fourth show at the Claridge Hotel since last year.